Once again, I am deeply indebted to Mr. Paul Steinson for the following treasure! I am very happy to be able to present this on Mr. Steinson's behalf. He kindly provided me with his dub of the original set, as well as the above label scan; I have only passed the dub through the marvellous ClickRepair (declick and decrackle), monoed it and joined up the sides where necessary - no more. Any definciencies are thus of course mine! Download the 4 mono FLAC files, fully tagged, in a .rar file here. My other favourite recording of this lovely Sonata is by Lola Bobesco and Jacques Genty, recorded in 1950 by Decca and reissued by Testament. 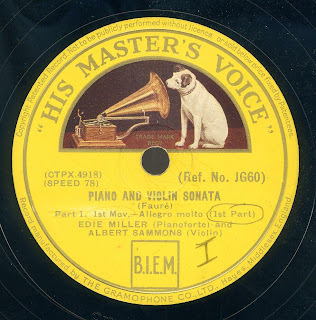 I see Sammons and Edie Miller made at least one other privately issued duo recording together, of Turina's Violin Sonata No.1 in D Op.51, on three 78 sides; on the odd side, Edie Miller played Poulenc's Mouvements perpetuels. The Steinson cornucopia will continue shortly, with two rare acoustic concertante sets played by Anderson Tyrer with the British Symphony Orchestra under Adrian Boult! A friend suggested I try reequalizing this with the Blumlein curve (using brilliant Brian's wonderful Equalizer) and, I agree, the recorded image is now clearer and better balanced - but the surface noise obtrudes more! Anyway, see what you think: as before, 4 mono FLAC files, fully tagged, in a renamed .rar file here. Pristine Classical has now redubbed and remastered this recording and made it available as a commercial download; better still, it is coupled with Sammons' 1926 Columbia set of Beethoven's Violin Sonata in A Op.47, the 'Kreutzer', never previously reissued on CD or as a download (the only reissue I know of was a 1982 Pearl LP). As I very much support Pristine's work and don't wish to take away its custom, my version may no longer be downloaded. Information about Pristine's reissue can be found here. Listened to this today. Great stuff - as always. Many thanks! Thanks for this lovely recording. Elegant playing and remarkably fine sound. Thank you so much for this and for all of your posts. Hate to ask, but is there any chance of getting more of the Bernard Brandenburgs? Thank you all for your kind comments! I may repost the Fauré with revised EQ. Please, always feel free to ask for anything - but I'm afraid I don't own the Fauré or the Bach, and I don't believe Mr. Steinson has any more of Bernard's Brandenburgs. I've also finally seen your CRQ article about downloads - wonderful! Thanks so much for writing it! Only criticism I can make is that some people might get the impression that Bill Anderson has been following in my footsteps when in fact it's the other way around! Bill (along with Damian) is the true pioneer in the download field and he inspired everything that I do. Nice, but nowhere near the Thibaud/Cortot version. Just listened to the Pristine Classical version, great website.